Little discernable progress with the D49 over the last few weeks as the Layout Challenge kicks off. However I have been redoing the wheels; I was concerned that they were not sufficiently central when looking at the chassis face on. This became more apparent as I proceeded with the loco-motion. So out come the wheels and, similtaneously replacing the muffs, back in they go; hopefully this time more symetrically. This was a tricky process as the slidebars and crossheads are now in place and care is needed not to damage them. Having undertaken this remedial work, I move onto the motion proper. You may recall that this is the work we are instructed to practice for. And it soon becomes obvious why. The links and arms are miniscule and making moving joints between them is a trial to say the least. This makes soldering coupling rod washers on seem a doddle. The left hand side is the lubricating motion. At this point the instructions become quite dense and I found myself losing track and failing to understand how the whole was constructed. As well as rereading the instructions several times, I found reference to photographs in the RCTS book most useful and eventually felt confident enough to proceed. Manufacturing the two joints to assemble the three components was fairly straightforward; this work could be completed in the vice and cleaned up with relative ease. 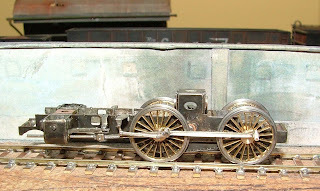 The assembly must then though be attached to the locomotive and necessitated holding the chassis in a cradle whilst the final joints were made. Attaching the swing link to the bracket on the chassis, the very last joint is the crank onto the the front wheel crank-pin. Being a layer of wheel > coupling rod > connecting rod > washer > crank, extra care was needed to avoid soldering the whole into a horrible mess. Once acheived, the whole lot was carefully cleaned up with files and abrasives and then washed to remove any stray flux.